As you can see, my Frozen obsession continues apace. Also, this is the third (yes, the third) time I’ve done a mashup of “Thrift Shop” with a fictional universe. It’s possible I have a problem. But I’m happy with how the drawing turned out. Art has never been my strong suit, but I like making it occasionally. 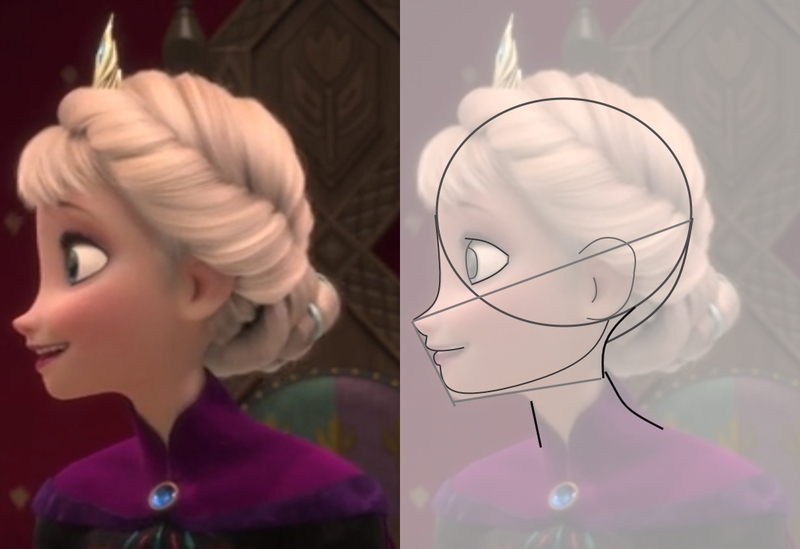 Lately I’ve been practicing how to draw Disney style — specifically, how to draw the Disney princess head in profile. I’ve filled several sheets with sideways-looking heads, gradually getting less bad as I go. My main teacher was this tutorial, which was very useful. If Elsa still looks a bit odd, that may be partly because the Frozen characters’ facial proportions are a bit different than “standard” Disney (Belle, for example). Even in the movie, her profile seems a little strange. On the right is my attempt at breaking down the head into its constituent shapes and lines, using the tutorial as a guide. Having a framework like that makes the whole thing much easier. Not like that’s a shocking revelation (HEADLINE: Artists construct complex drawings from simpler structures; details at eleven) but using a formal-ish approach like this is new for me, and I’m liking it so far. Hm … I said I was going to talk more about Evan, didn’t I? Welp. It’s clear where my priorities lie. Kids’ movies: more interesting than kids?? Details at eleven. A few weeks ago, Betsy showed Evan a YouTube video of the scene from Frozen where Elsa sings “Let It Go.” He was instantly enthralled. Now it’s virtually the only video he’ll watch at all, aside from home videos starring himself. Anything else we try to play, he says “Ah duh” (All done) until we stop it. 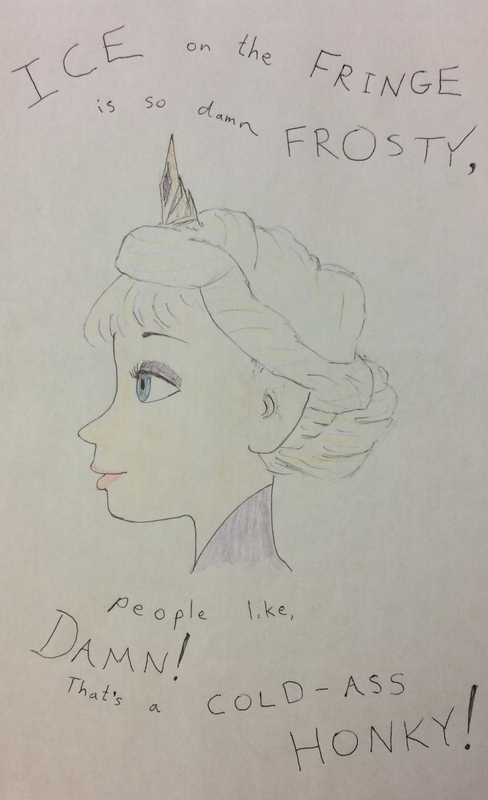 Frozen, and “Let It Go” in particular, are infamous for being loved by kids and hated by parents. That’s not because they’re poorly made, it’s because adults hate anything they hear ten thousand times in a row. But I like the movie, and I love the scene. For starters, you don’t have to listen to it ten thousand times in a row. One of the many perks of being a parent is that you can say no sometimes. So we watch the video maybe twice a day, which is eminently bearable. More importantly: in my humble opinion, the scene is a masterpiece. 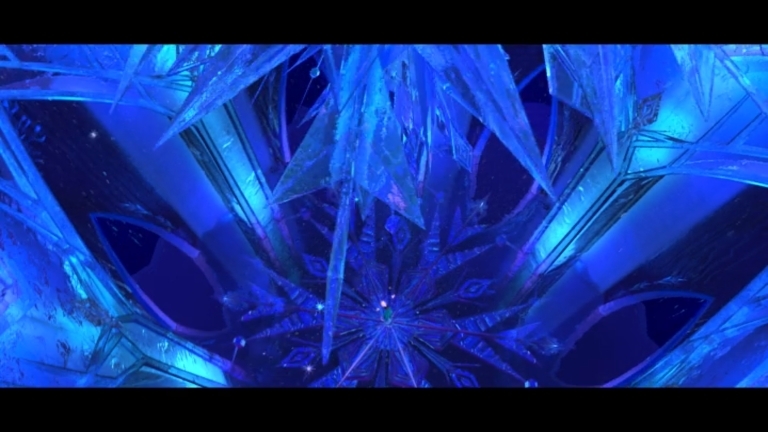 Beyond the obvious stuff (gorgeous CG, great music), “Let It Go” actually does an amazing number of different things at once, in terms of plot, character, setting, and theme, plus a thousand cool little details. 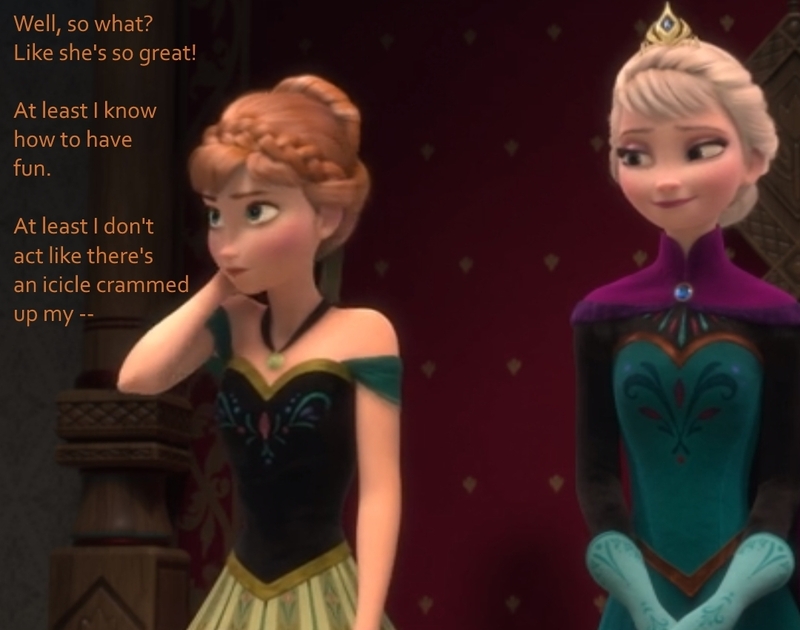 Whether you like Frozen or not, there’s a lot going on here, and I’ve gotta talk about it. Thoughts can only rattle around in my head for so long before I’ve gotta write ’em down. Some quick context. 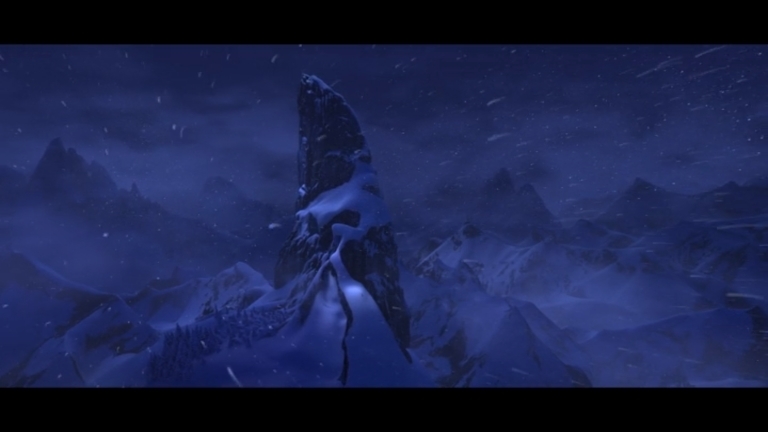 “Let It Go” takes place about half an hour into the film. 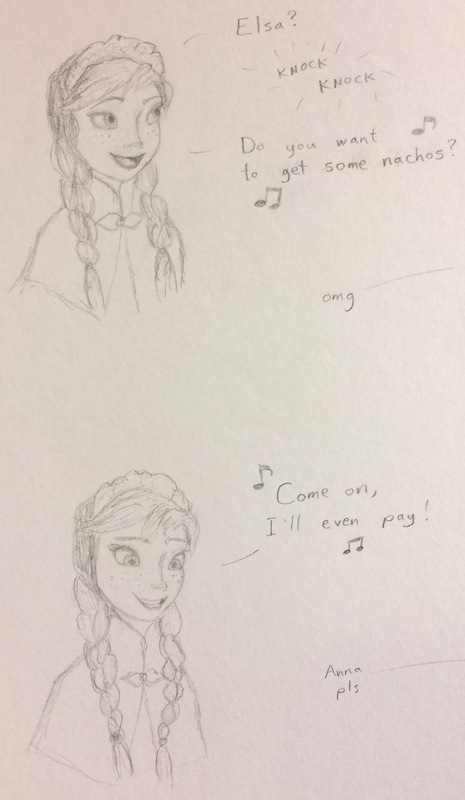 Elsa (the one singing) has magic ice powers, but she’s suppressed them and isolated herself all her life, afraid of hurting those she loves (especially her younger sister, Anna). 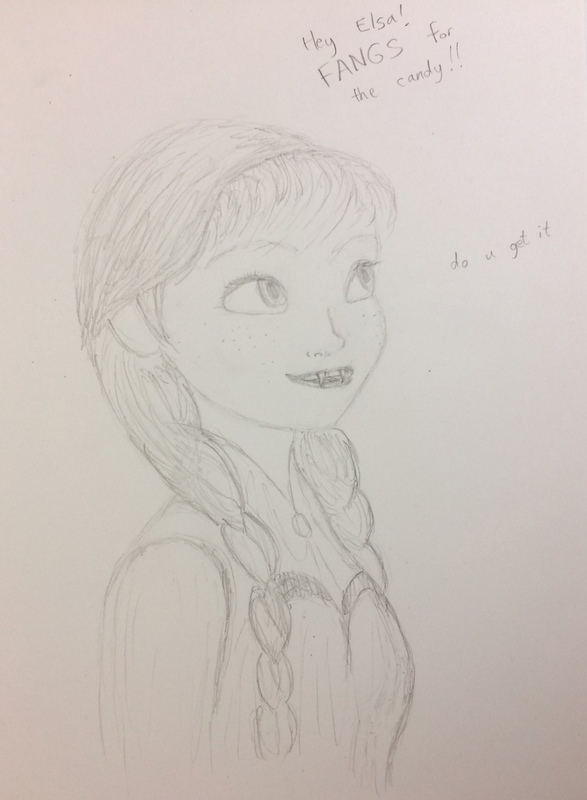 When Elsa comes of age, she is crowned Queen of Arendelle, but an argument with Anna makes her lose control of her emotions, and her power flares up, horrifying everyone. 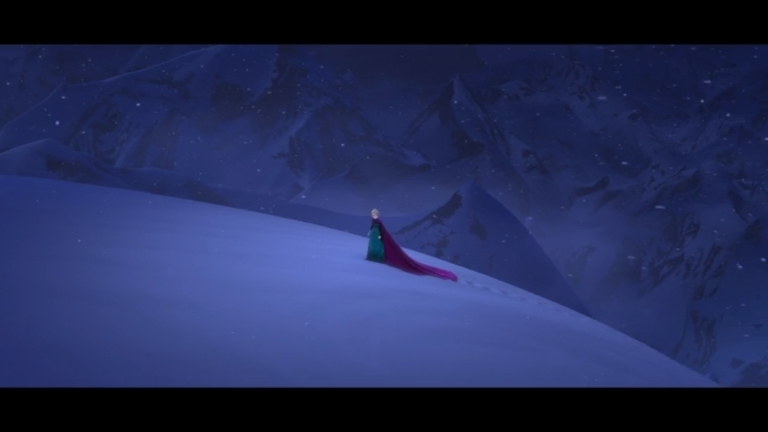 Elsa flees into the mountains alone. Cue music. If you want to see it, here’s the video (three and a half minutes). I’ll take it line by line. Setting the stage. When she talks about seeing no footprints, of course she means that nobody else is around, but notice how her cape obscures her own tracks too. By not leaving footprints, she’s less like a person, more like a part of the snow itself. I love the pun: “A kingdom of ice … olation.” It’s subtle and doesn’t distract from the serious tone, but she holds the first syllable just long enough that I think it’s deliberate. “I’m the queen” refers not only to her snowy “kingdom,” but also to what she’s just left behind. Only hours ago she was crowned Queen of Arendelle, which was (indirectly) what forced her out here in the first place. She’s still queen, but she’s moved from one kingdom to another — although of course she was living in a “kingdom of isolation” all along, and is only now fully accepting that. This is an odd line. The “swirling storm inside” makes sense, but in terms of actual weather, there doesn’t appear to be any howling wind. (The snow is falling gently, and her hair and cape aren’t moving much.) 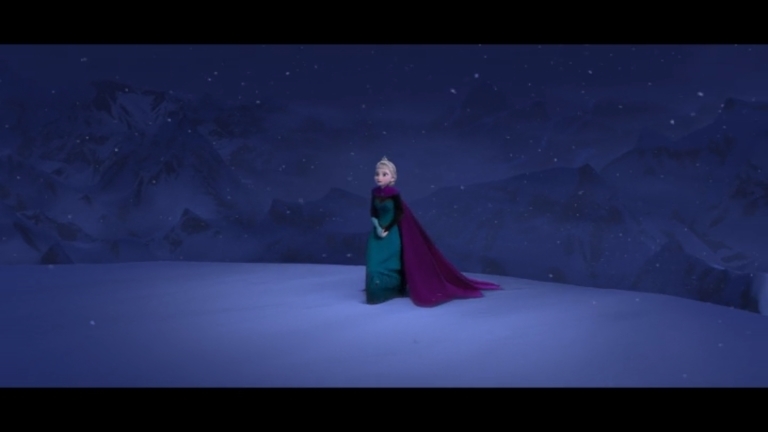 Of course, howling wind would interfere with her singing, so maybe it was a practical choice by the designers. Or maybe she’s losing the ability to tell her feelings apart from reality — there is, after all, a close physical link between the two. Couldn’t keep it in, heaven knows I’ve tried. One of my favorite lines in the song, not because of any special cleverness, but because of the way it humanizes her. She sings this softly, understating the monumental effort and the scars that self-repression have caused her since she was a child. She’s hugging herself just like anyone would do in the cold — but remember, she’s not cold at all. Her body language is only a reaction to pain. Call-backs to lines earlier in the movie. 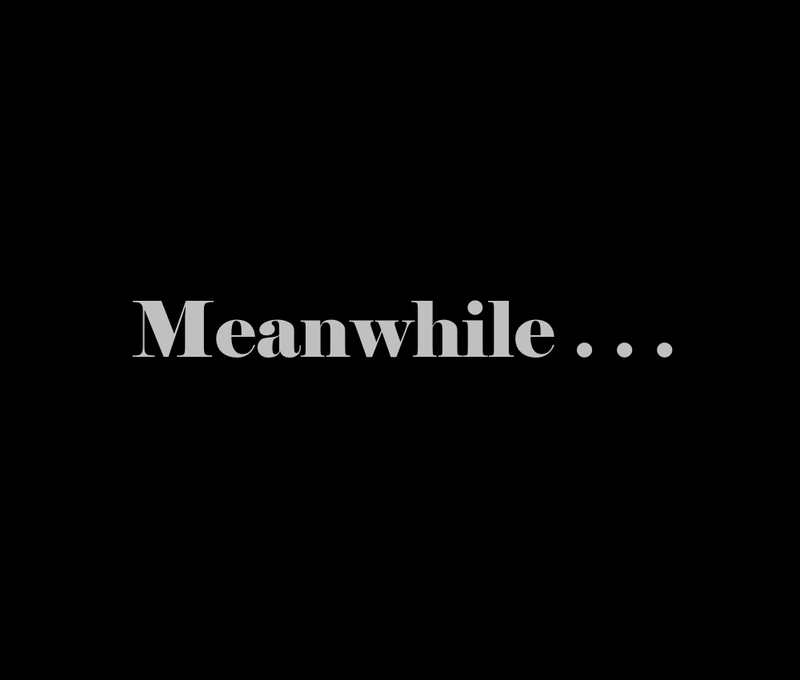 As we’ll see, this song is tightly connected to several other songs. I like how she’s wagging her finger as she says “Be the good girl” — chiding herself, showing how deeply ingrained her parents’ reprimands have become. More call-backs to earlier lines, encapsulating the struggle that’s dominated her entire life so far. Removing the glove symbolizes rejecting her repressive lifestyle blah blah blah, of course it’s a beautiful moment, but honestly what I love most is the look she gives the glove before she flings it off. That’s the same look your teacher gives you when she says “See me after class.” I almost feel bad for the thing. Okay. So much to talk about here. 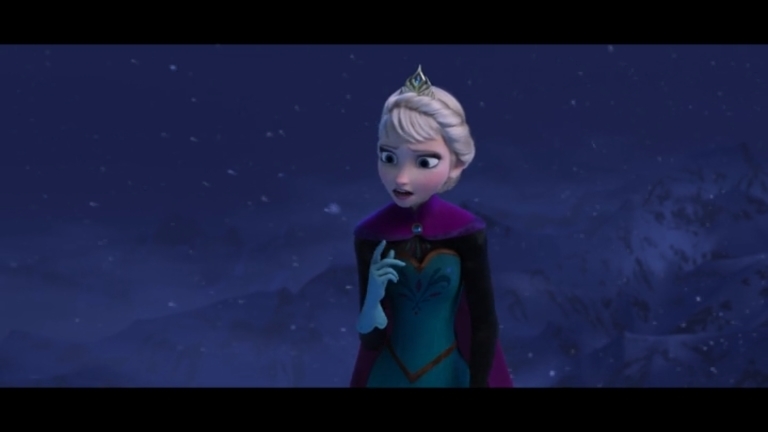 “Let it go” isn’t just a catchy lyric. This precise moment is the turning point of the entire first half of the movie. By all indications, she didn’t plan to come out here and embrace her powers — she was just running away. At the start of the song, she still didn’t know what she was going to do. We have been watching her figure this out in real time, and it just happened. One of the things I love most about this song is how transformative it is. Most Disney songs are about expressing a feeling (e.g., Belle singing “There must be more than this provincial life!” in Beauty and the Beast), or signaling a new direction for a character (e.g., “Prince Ali” in Aladdin), or advancing the plot (e.g., Scar’s “Be Prepared” in The Lion King). 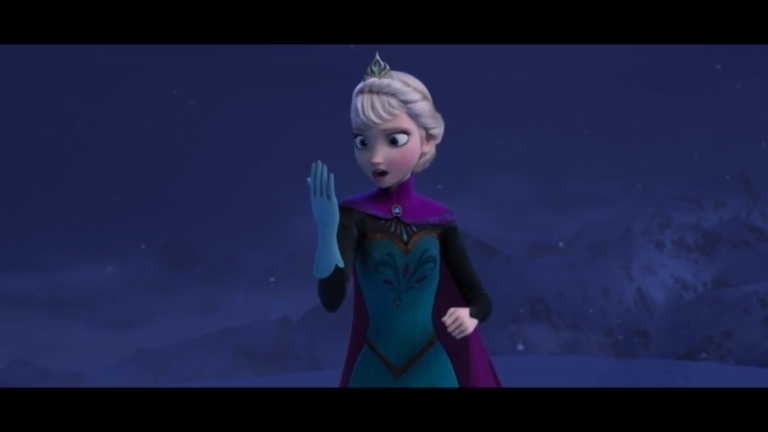 “Let It Go” does all three at once, but it also does something more: it transforms the character singing it. 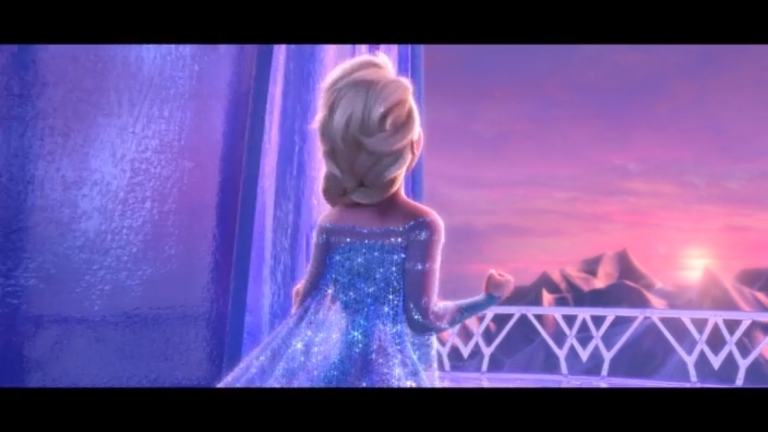 Elsa is a different person at the end of the song than she was at the beginning. There are other Disney songs that do this, but I can’t think of any that do it so dramatically or so well. Also — look at her face. Look at how happy she is. We talk about someone “taking power” or “seizing power” or “holding power,” all of which suggest strong effort. 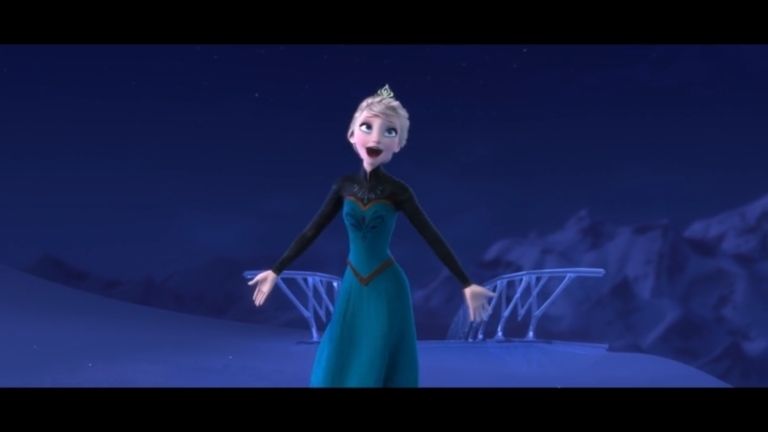 But Elsa, as the title suggests, gains power by finally, finally releasing her grip. She hasn’t felt freedom and joy like this since her very first scene with Anna, near the start of the movie. It’s just cool to watch (not to mention the outstanding special effects and the lighting). 1. Just a coincidence, or some accident in creating the scene. 3. 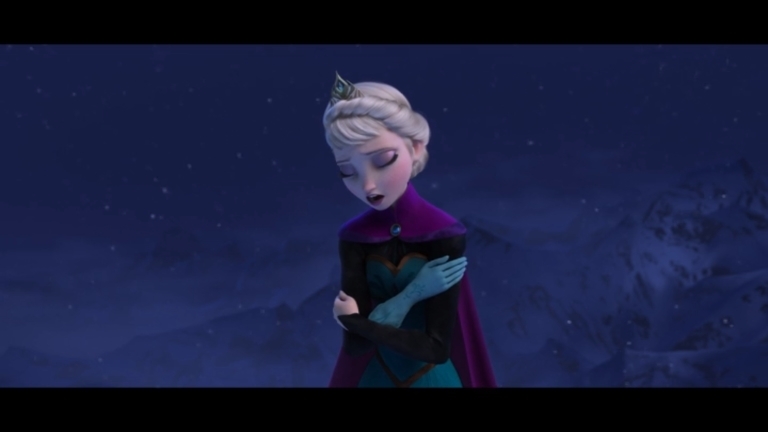 My favorite possibility: This is the moment when she fully embraces her powers, and because she has no particular wish for it to snow right now, it simply stops. All right, all right, I’ll move it along. See, this is why you’ve gotta watch the video and not just listen to the music. Here the words are much less important than what she’s doing — she’s building Olaf the snowman. This happens fast, and it’s easy to miss the first time you watch, but it’s pivotal for the rest of the story. She creates a character. (We won’t dwell on the divine connotations of willing new life into being ex nihilo.) 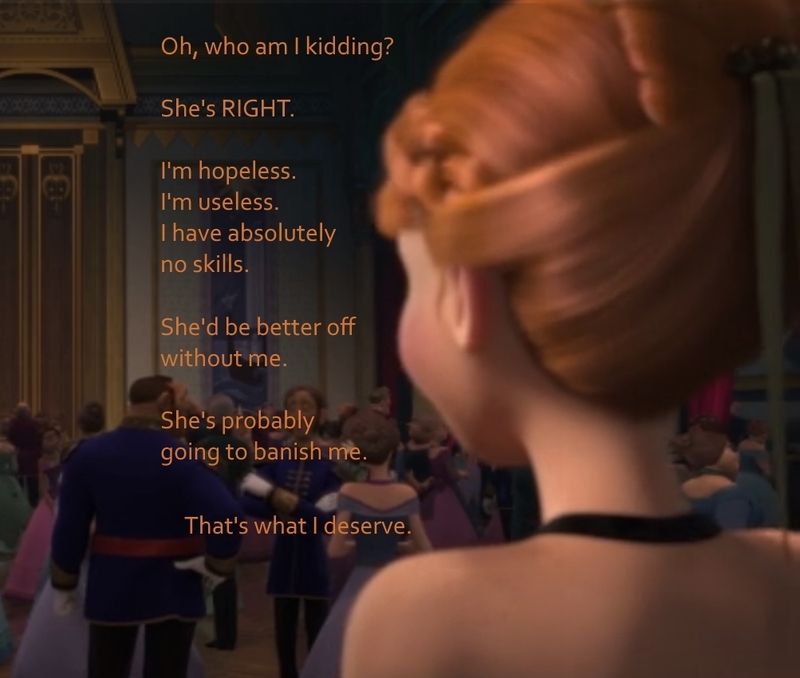 And not just anyone, but a character who will lead Anna to Elsa, and later save Anna’s life. This isn’t the first time we’ve seen Olaf. 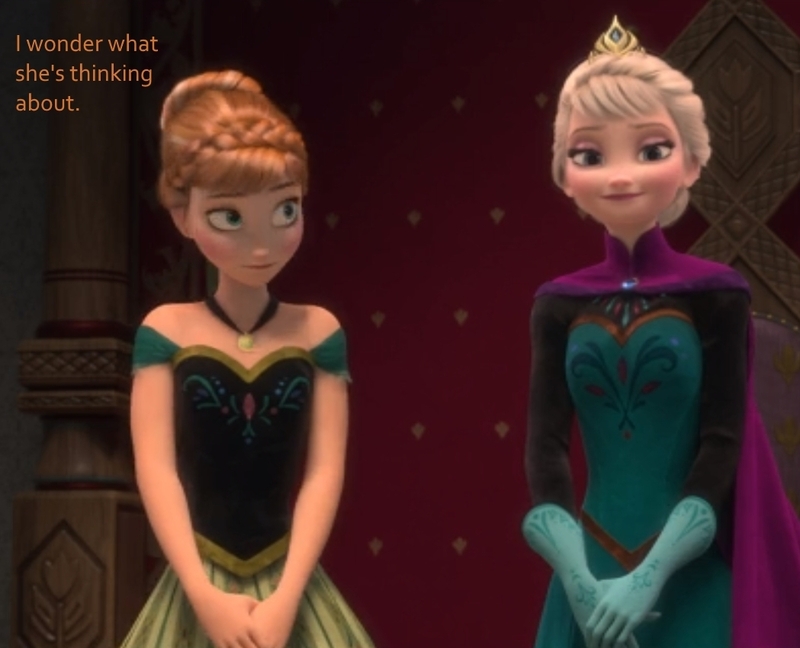 When Elsa was playing with Anna as a child, she created a non-sentient version of him then. 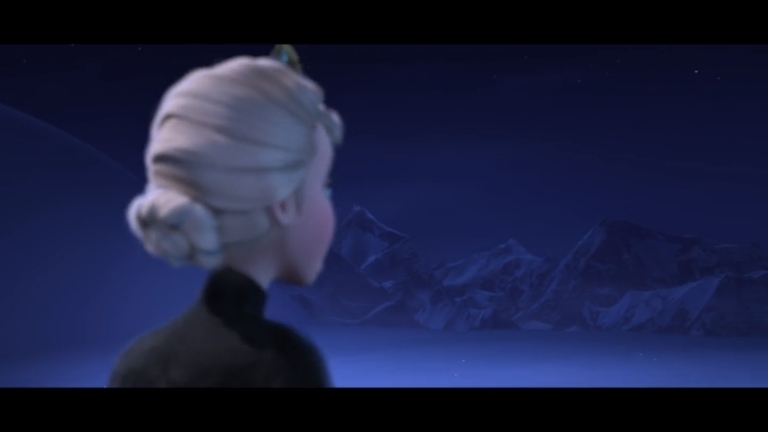 Afterward, when Elsa is forbidden to play with her sister anymore, Anna’s plaintive song “Do You Want to Build a Snowman?” uses Olaf as a symbol of their close bond, which has now evaporated. 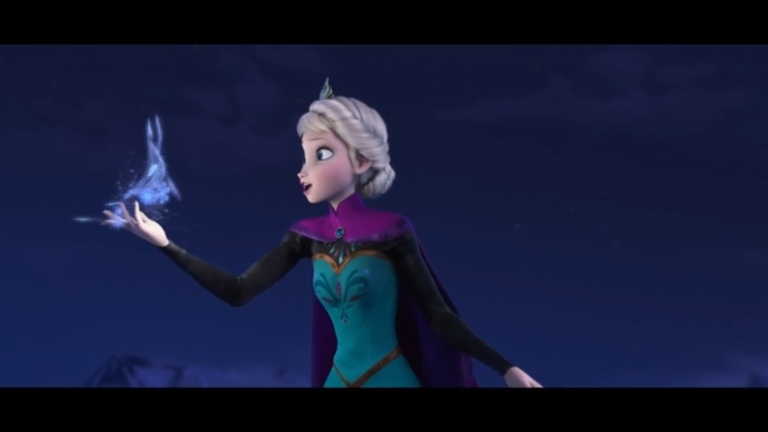 By finally “building the snowman,” Elsa unknowingly forges the beginning of her reconnection with her sister, because Olaf will lead Anna to her later. Kind of a funny moment for a song that’s all about being alone. That last bit, about slamming the door, is crucial to the larger story. 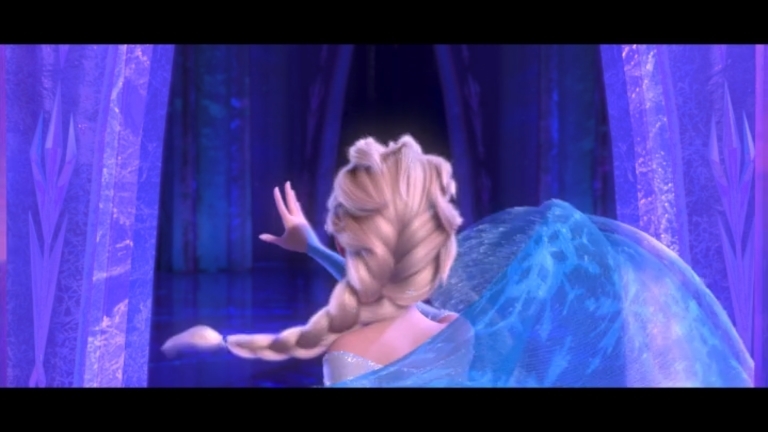 Elsa may have built the snowman, but she’s far from opening the door. “Let It Go” is often seen as liberating and empowering (and, by extension, feminist), and it certainly is all those things. 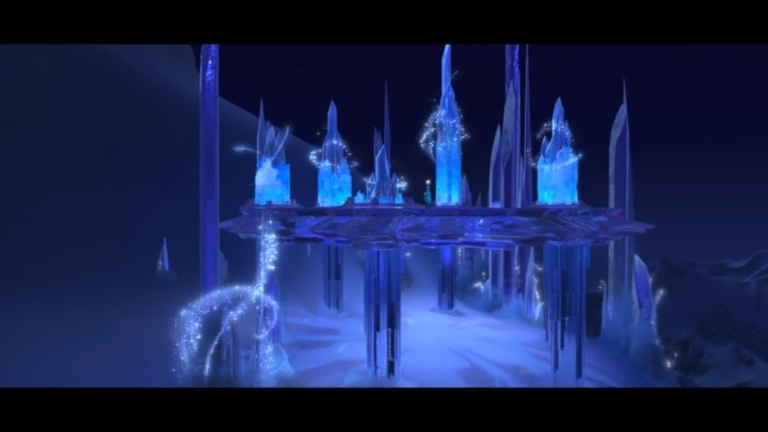 But it’s also a monument to how blind Elsa still is. She thinks she’s free, but she’s still trapped in the same old dichotomy of embracing others vs. embracing myself. She’s merely moved into the other half of the box. Yes, it’s tremendously gratifying, but in the end she’s merely swapped a smaller prison for a larger one. This empowered-but-blind theme shows up in other Disney songs too, notably “I Just Can’t Wait to be King” from The Lion King and “Prince Ali” from Aladdin. It works really well in all three; but in all three, the empowered part is so dazzling that it’s easy to miss the blind. She’s starting to have fun with her powers, and it’s fun to watch. Notice, though, the language she uses: she doesn’t care what “they’re” going to say. This song is all about rejecting them and they in abstract terms. Tellingly, she doesn’t mention Anna by name even once. She’s focused entirely on herself. I’m not blaming her, of course — the poor woman’s more than earned it — but it shows how much of her road still lies ahead. Also — remember how I said the song is transformative? 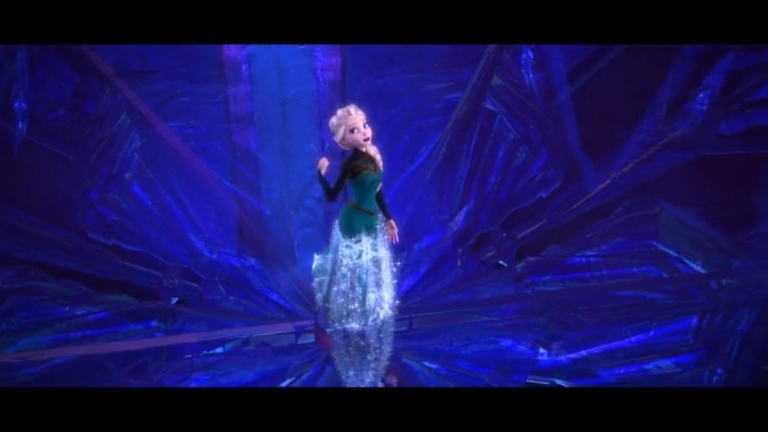 We’re talking mainly about Elsa’s psychological transformation, but there’s a physical transformation too. First she removes her glove, then her cape. Clothing change is another motif that recurs throughout the song. There’s a little pause in her singing here. The line “Let the storm rage on,” and the brief pause for some instrumental music, signals the end of the first part of the song (out of three parts total). 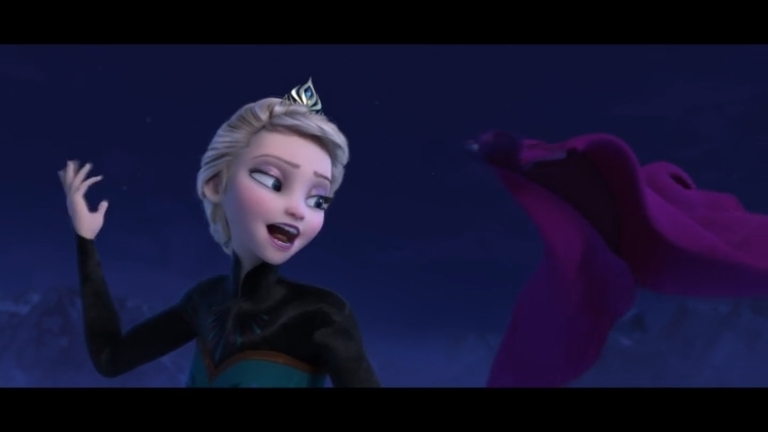 The first part is about Elsa deciding to embrace her power. Let’s move into part two. Of course the “distance” comment is also both physical and metaphorical. But listen to how she talks about her fears — she doesn’t say she’s conquered them, or made peace with them. She says, essentially, that she’s managed to run away from them. (“Run Away” probably isn’t as catchy of a title.) Nevertheless, her joy is infectious. There are two places in the video where Evan says “Whoa!” every single time (although it comes out more like “Whaaww!”). This is the first. And he’s not wrong. 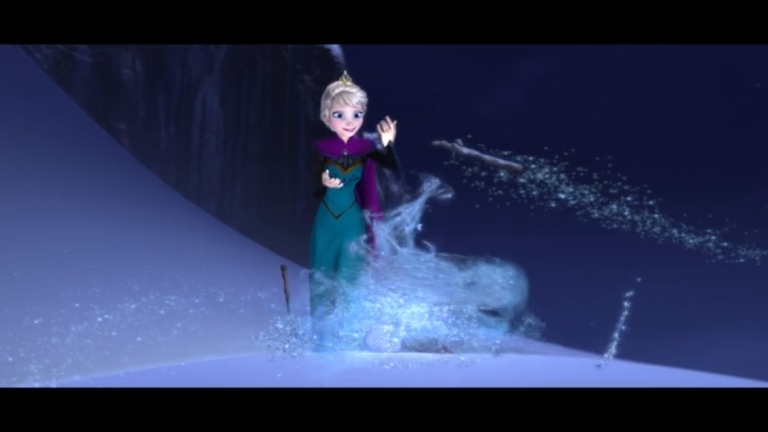 Here, we get into what part two is all about — Elsa developing her powers, pushing them further than ever before. In the past, she’s done relatively unfocused blasts of snow and sheets of ice (plus the occasional Olaf). Now, she’s creating something new, something beautiful and useful — a path over the chasm. 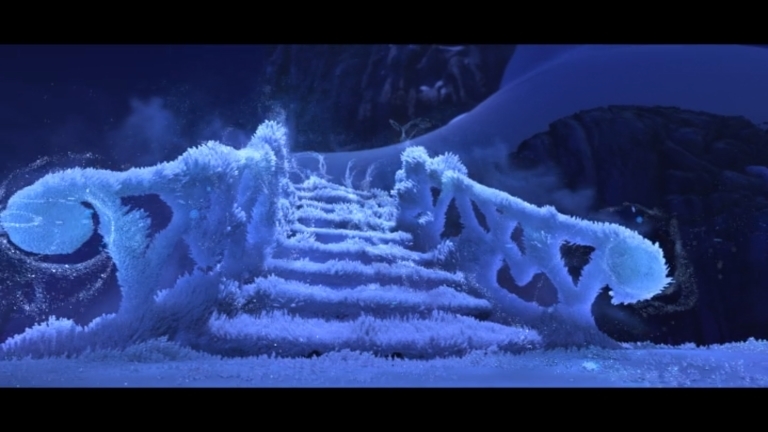 Ironically, the same stairway she creates to escape from her old life will later carry Anna back to her again. I’ve already talked about how free she is (and isn’t), so I won’t belabor that any more. Let’s look at what she’s actually doing. In the past, her powers have allowed her to do two things: create snow (usually with her hands), and create ice (usually with her feet). Now she’s doing something different. She’s creating a “rough draft” in snow, then refining it into ice. 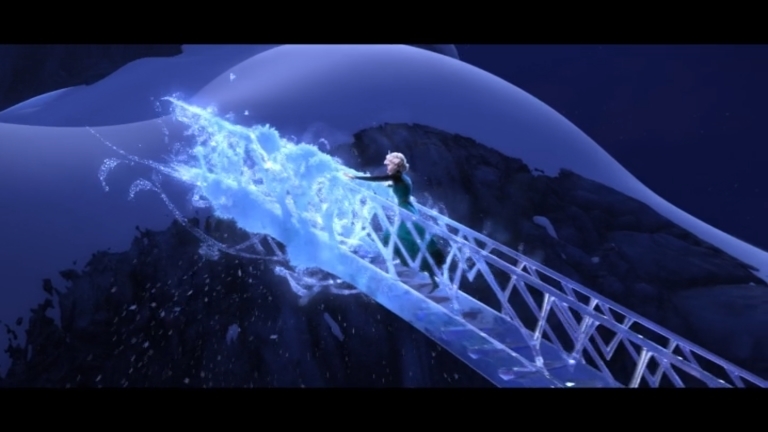 Watch — as she runs across the bridge, she’ll continue to do this snow-to-ice trick in midair. It reminds me of the scene in X-Men where Magneto builds a bridge from flying metal as he walks calmly over an abyss. See? That’s what I’m talkin’ about. I mean, you could say this isn’t total sweetness, but then you would be wrong. And the line about being “one with the wind and sky” further identifies her with the forces of nature, as opposed to humanity. Remember that thing earlier about Elsa having no footprints? She still doesn’t have any, but this time it’s because she’s running over a bridge that she willed into existence. Even with the sound off, this would be cool to watch. To be clear, she will be crying constantly, it’s just that nobody will see it, because she’s way up in the mountains. Tee hee. I continue to amuse myself. Here I stand and here I’ll stay. The end of part two. 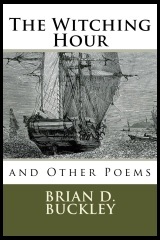 As before, we have the line “Let the storm rage on!” followed by a wordless interlude. 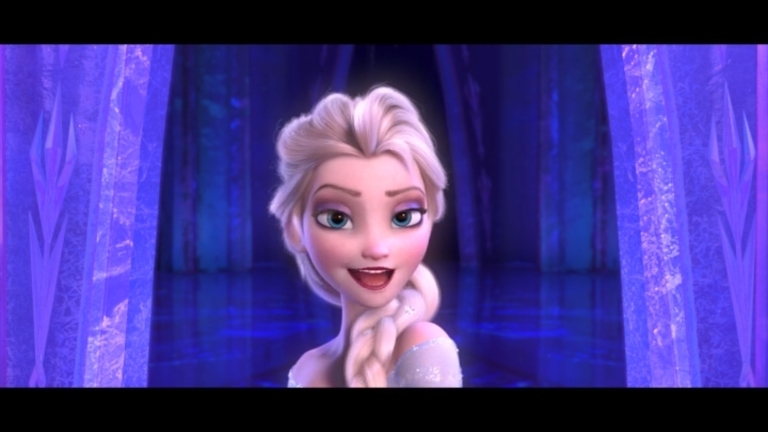 But unlike parts one and three, here we omit the final piece: “The cold never bothered me anyway.” Why? 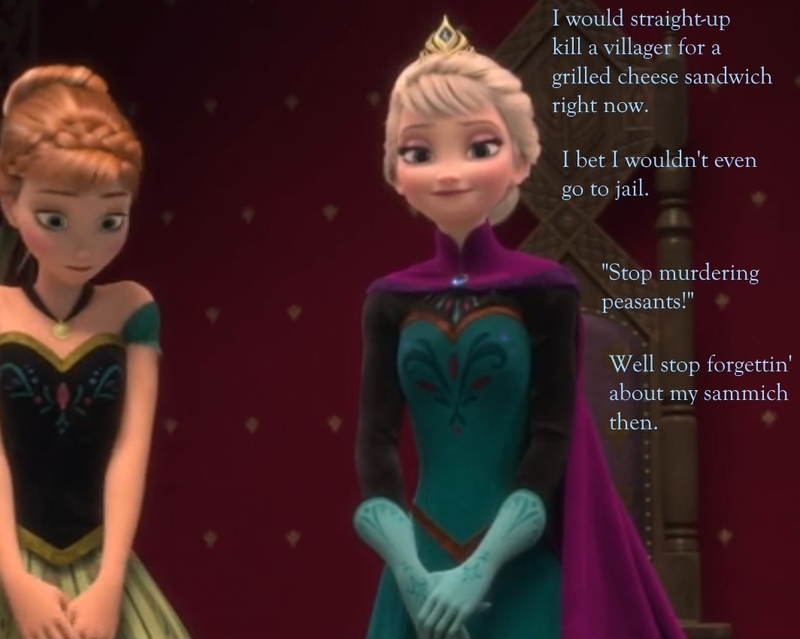 Because Elsa’s busy, and it’s about to get real. This is the second place where Evan says “Whoa” (every — single — time). 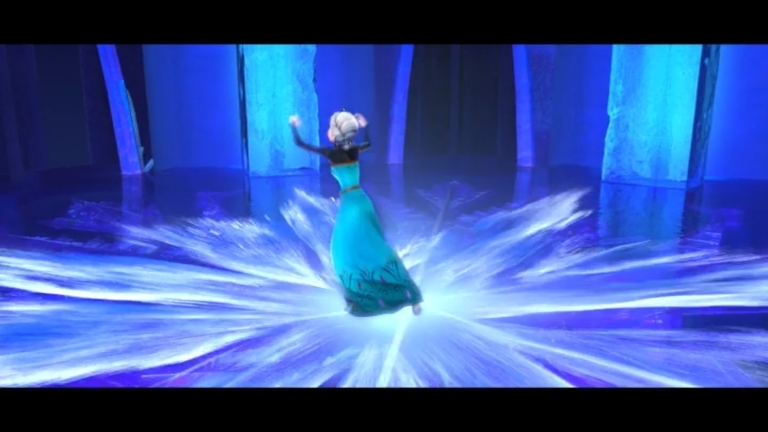 Elsa, in an almost physical effort, reaches down to lift her new creation. 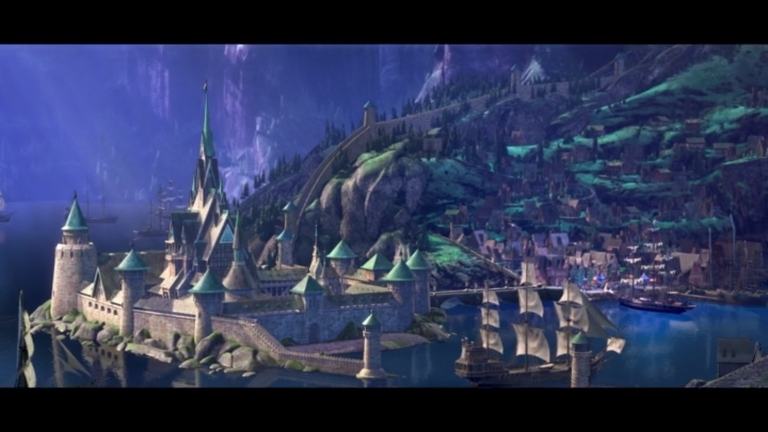 Having made an entirely new character (Olaf), Elsa now builds a whole new setting, too. She’s just realized she’s Superman, and it’s time to construct her Fortress of Solitude. Her confidence is growing — she dispenses with the snowy “rough draft” from before, and now works directly with ice. The music really starts to pick up energy around here. Meanwhile, with this display of power, part two concludes. She’ll keep developing her abilities after this, and will sing about it some, but that will no longer be what the song is mainly about. One of the few lines that doesn’t seem to have a metaphorical side. She’s simply narrating the mechanics of her ever-growing magic. Till now, she’s mostly worked in the air and on the surface of the ground (hence “flurries”). By raising the palace, she’s lifting icy foundations directly from the earth. 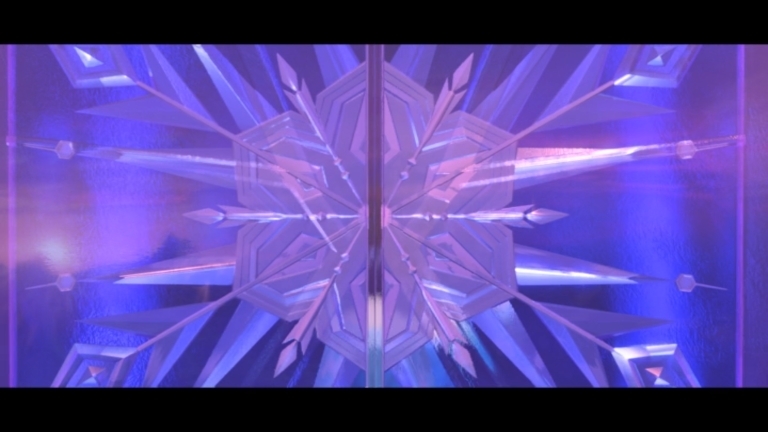 My soul is spiraling in frozen fractals all around. The palace symbolizes her soul in its power and isolation blah blah blah. Okay but let’s talk about fractals. I love that she uses that word. Partly it thrills my inner math geek because she’s using it correctly (snowflakes really do have a fractal structure). And partly because it’s so appropriate here. “Fractal” derives (via French) from the Latin fractus, meaning fractured or broken. And that’s exactly what her soul and her palace are — big and beautiful, but broken. Incidentally, the word “fractal” wasn’t invented till 1975, by Benoit Mandelbrot, whose name you may know from the famous Mandelbrot set. 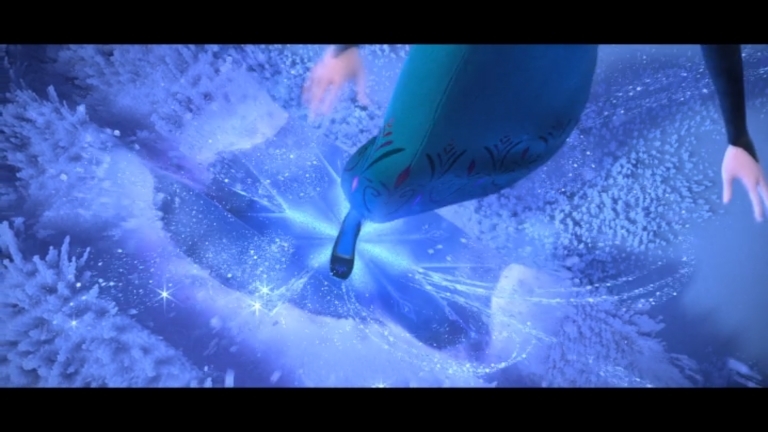 So Elsa’s use of it here is a bit of an anachronism. But I will — ahem — let it go. And if you’re asking (you weren’t) what fractals were called before 1975, well, the answer is even better. My good friend Ben Trube, who has written multiple books on the subject, informs me that fractals were sometimes called “monsters,” recognizing their bizarre properties and fierce complexity. 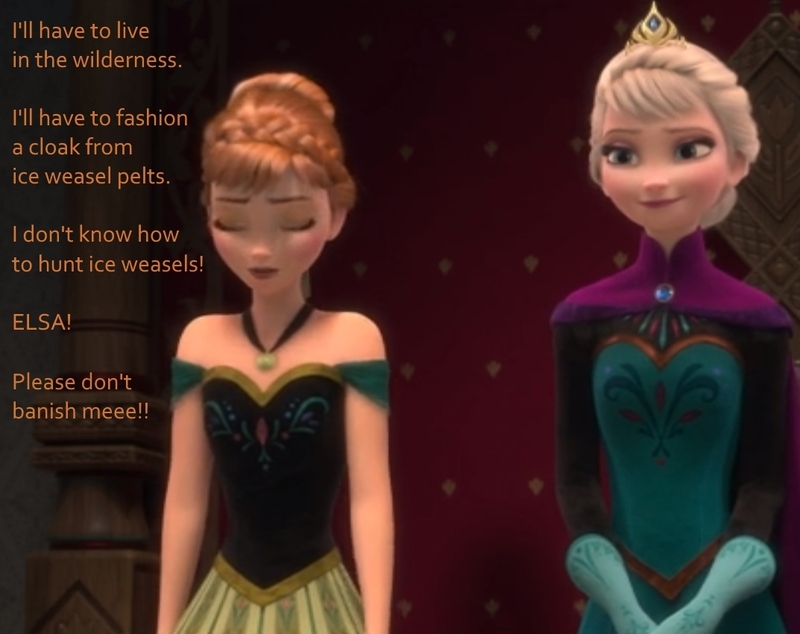 “Monster” is exactly what the Duke of Weselton calls Elsa at her coronation party, prompting her to flee. None of those connections were deliberate, I presume, but I still enjoy that they exist. Curious word choice. 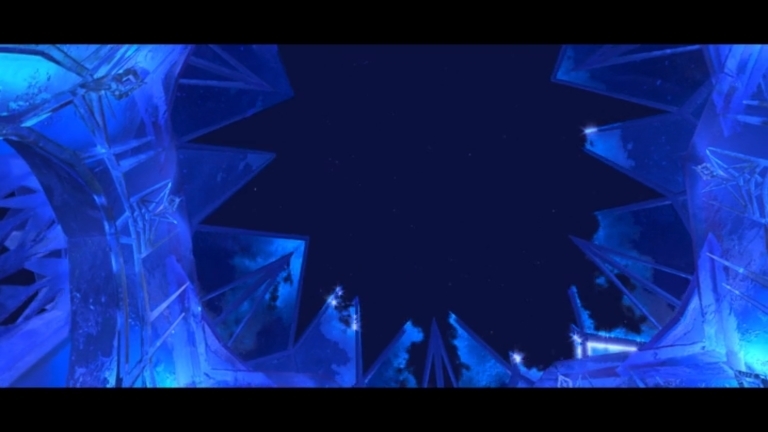 Does an icy blast become crystallized? I suppose a thought could crystallize with the power of an icy blast, but the construction is still kind of awkward. Again, though, I’m just nitpicking (it’s a hobby). What matters is the line that comes next. 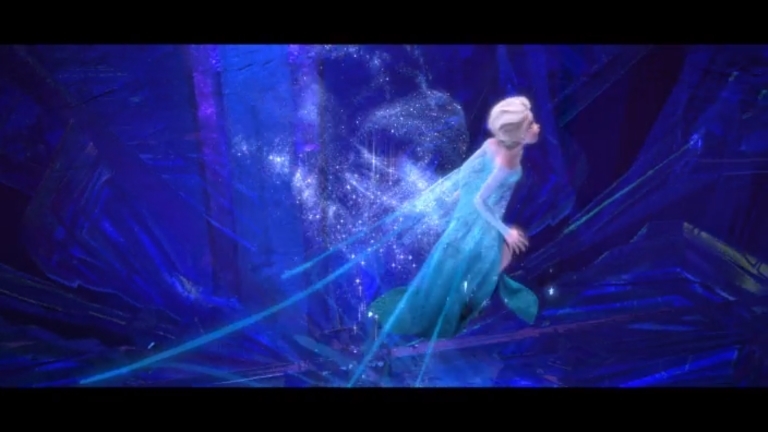 “Let it go” may be the theme of this song, but this line is the climax. It’s the second big shift in her character, the raison d’être of part three. Before, she was just accepting her forbidden power. Now, she’s also rejecting her old life. It’s striking that the big climax of the entire scene is also 100% wrong. Because of course the whole point of the movie is that she does go back, that her past does still matter. Her power/blindness duality is never stronger than it is right here. But for me, her action (throwing away the crown) is more interesting than her words. This whole scene has paralleled her coronation scenes, but with everything inverted. Think about it. She’s Queen of Arendelle, and then she’s queen of the empty waste. She takes off her gloves in fear, and then in triumph. It was day, now it’s night. She flees the human palace and enters an ice palace. She was crowned by someone else — and now, at the end, she uncrowns herself. The anti-coronation is complete. On a more practical level: Where does the crown go when she throws it? She’s in a big, enclosed room that’s nothing but hard ice and flat surfaces. I’m sure someday we’ll get a Director’s Cut that restores the delightful sounds of a tiara clattering across a glassy floor. Because I am a crazy person, this line bothers me a tiny bit. The break of dawn is an event — it doesn’t rise. The sun is what rises. Undeterred by this pedantic concern, Elsa continues her physical transformation. She pulls her hair loose, and then the dress changes too. Having converted her dress to the winter fashion, her final physical change is to add a cape. Of the things she removed (gloves, cape, crown), this is the only one she brings back for her new wardrobe, which of course makes sense. 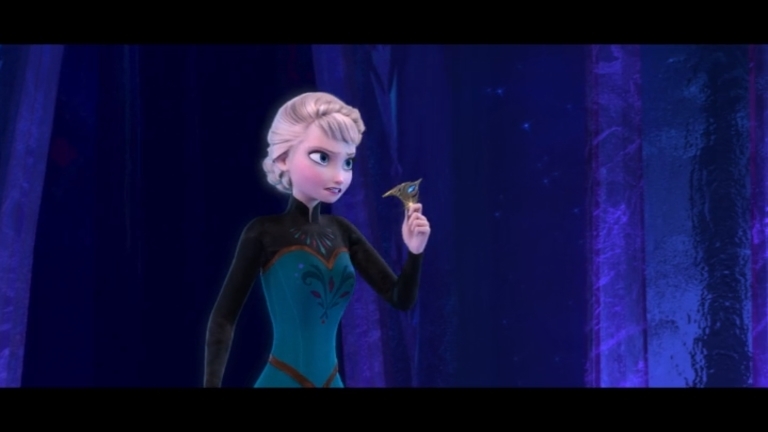 Because her dress is a frozenization (ahem) of her old one, it retains some aspects of the old design. For instance, the backs of her sleeves still have little pointy bits of fabric — to use the technical sartorial term. Yet another transformation is complete — from night back into day. At the risk of belaboring this point, there isn’t a storm. Metaphor, I know, but it’s just weird that they do this epic zoom-out as if to say “See what a big storm?” and it’s actually calmer and clearer than ever. This bugs me more as I watch it more. There are worse problems to have. 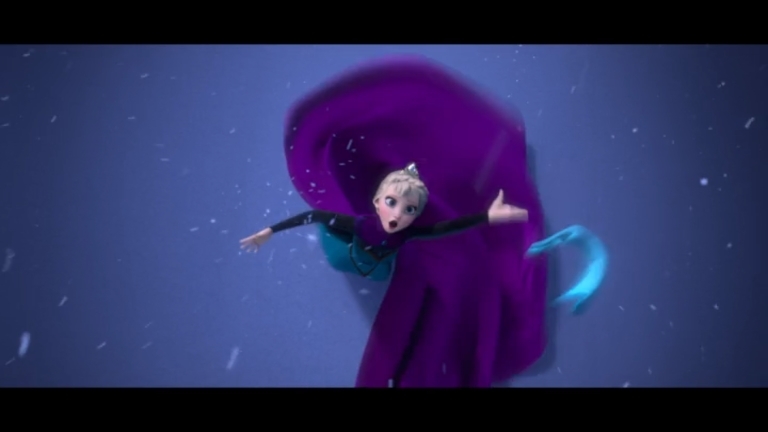 With that snappy little finish, part three concludes — but not before Elsa whirls dramatically and slams her ice-door in our collective faces. 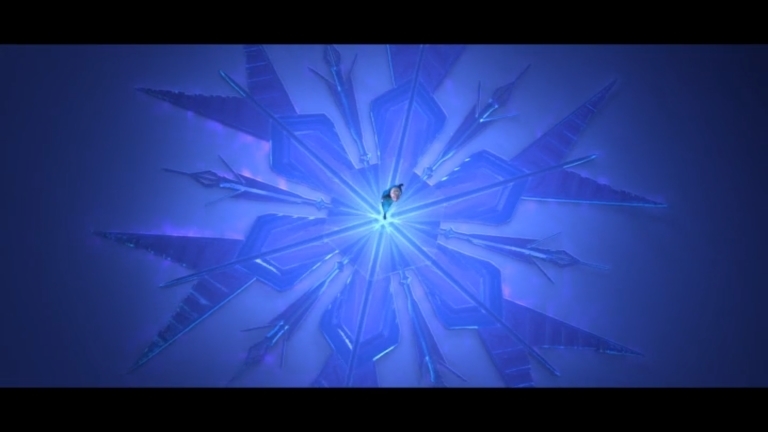 She has now done literally what she sang metaphorically at the beginning: “Turn away and slam the door.” And the final shot of the shiny snowflake takes us full circle, back to the very first line: “The snow glows white on the mountain tonight.” That’s a wrap. 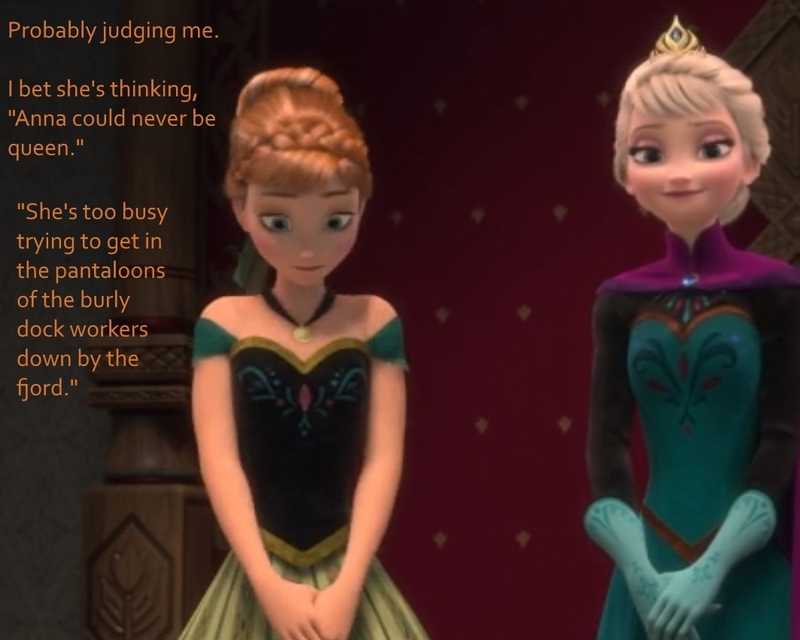 Jokes aside, this is a genuine story problem: after all that empowerment, Elsa does essentially nothing with her power. She’s a remarkably passive character. 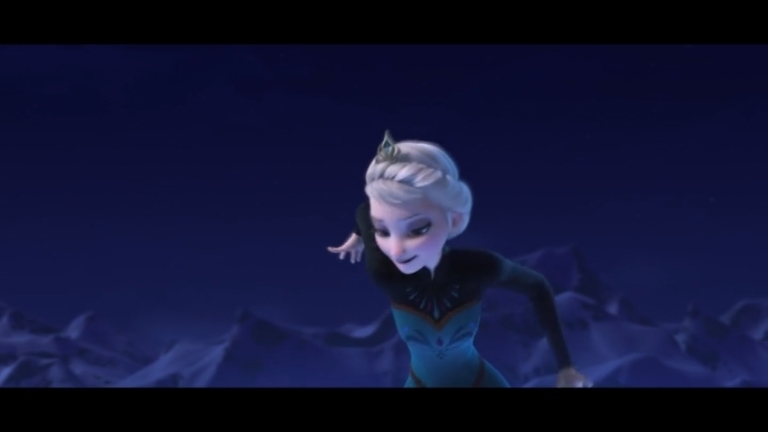 “Let It Go” is the highlight of her activity, and even here, she’s running away. Even Olaf is more proactively useful than her. 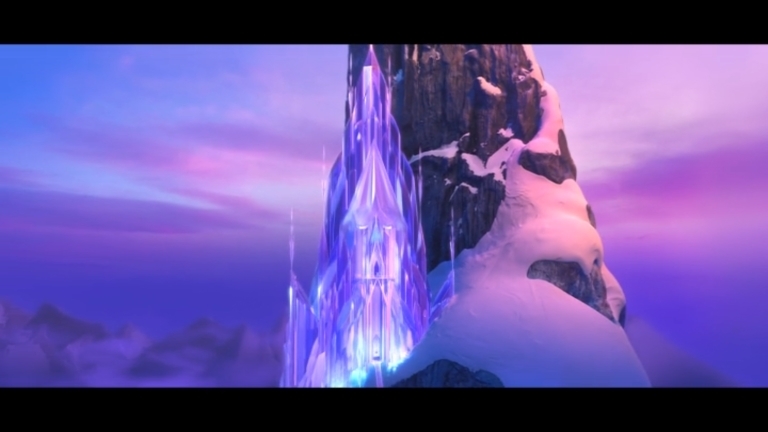 The film solves this problem by focusing mainly on Anna from here — Anna being the real hero of the story (along with Kristoff). That works well enough, but I find myself enjoying the half hour before this scene more than the hour after it, and I think that’s the main reason why. In the 1844 novel The Snow Queen by Hans Christian Andersen — the inspiration for Frozen — the Snow Queen is a less-than-heroic character, and earlier drafts of Frozen had Elsa as the villain. It was this song that made the creators decide she was good, and rewrite the movie accordingly. (Isn’t it curious that the new villain is named Hans?) 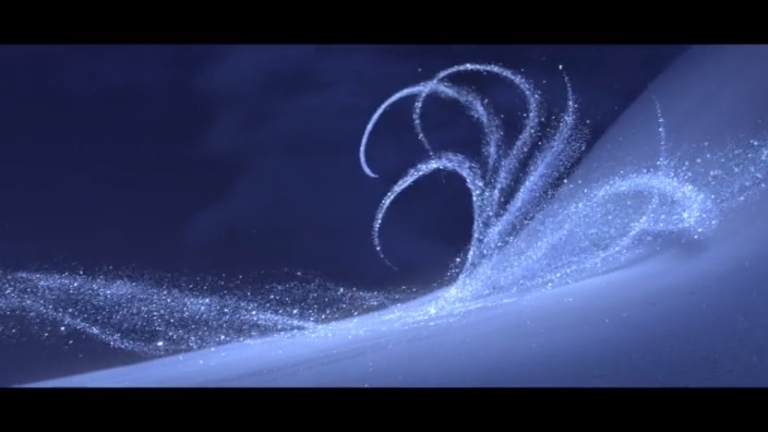 So not only did “Let It Go” transform character, setting, and costume, it even transformed the movie it was in. I can’t say this song is my favorite in the Disney canon. Possibly it’s not even my favorite from this movie. “Do You Want to Build a Snowman” is a powerful study in love and grief; “Frozen Heart” has a stark, thundering beauty; and of course “Reindeer Are Better than People” is possibly the greatest thing ever written in the English language. (Kidding. I think. Maybe.) 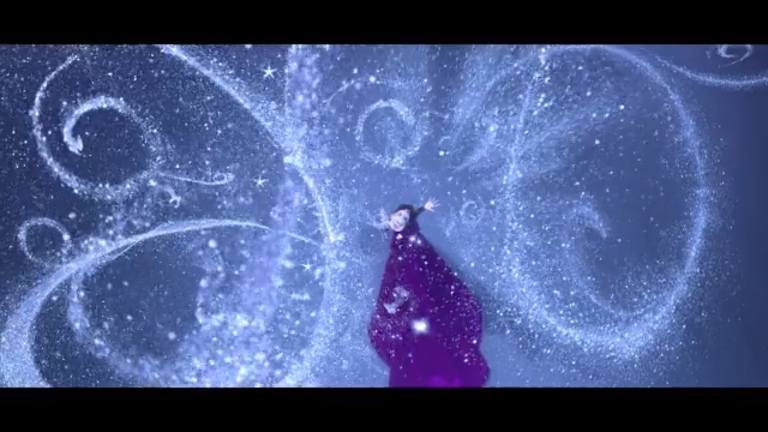 Still, “Let It Go” has a particular strength and sorcery all its own. Also, it’s the only Disney song I’ve ever written a 4,ooo-word article about. So, you know, there’s that.